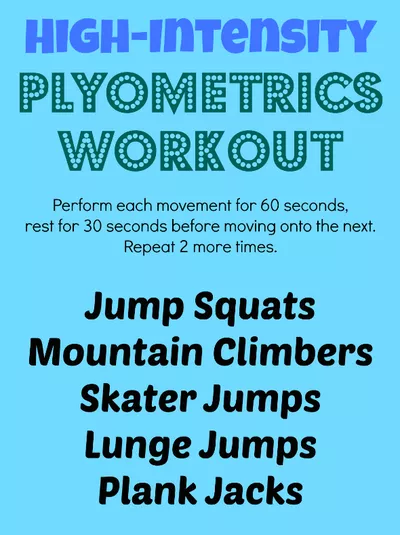 If you're looking to mix up your workout and improve your fitness level at the same time, try plyometrics! All you'll need for the workout below is a stopwatch and a little bit of space, which makes it an awesome do-anywhere routine. Perform each exercise for 60 seconds and then rest for 30 seconds before moving to the next one. Once you finish all five moves, rest for 1-2 minutes and then repeat the sequence twice more. Do this workout a few times per week to see results! Please consult your doctor before starting a new fitness program.